As far as we know, none of that is wrong. But what about all the middle-class people who receive (expensive) nursing home care through the Medicaid program, at least in certain states? To what extent does Medicaid pay for nursing home care for middle-class seniors? To what extent do middle-class voters understand this topic when they heard that Romney wants to slash spending for this program? We don’t know the full answer to that first question. That said, we’ll guess that the vast majority of middle-class voters don’t understand that Medicaid may pay the bills for the future care of their own parents or grandparents. 67 percent of respondents supported the Medicaid expansion in Obamacare. Even among middle-class families, 61 percent said that Medicaid was important to them. was because “you or someone you know” has received long-term nursing care via Medicaid. 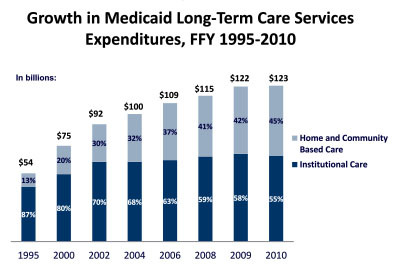 As a matter of pure numbers, total Medicaid spending in 2010 was a little under $400 billion, and of that, $123 billion was for long-term nursing care. So that’s roughly a third of Medicaid spending. That’s for everyone, of course, not just middle class folks, but it’s obviously a big chunk of Medicaid spending no matter how you slice it. And judging from Kaiser’s poll responses, most middle-class voters probably do understand that. It’s one reason the Obama campaign may have missed a bet by not making a bigger deal out of Mitt Romney’s plan to slash Medicaid and then dump the whole program on the states.